Rock band SIXX: A.M. — which consists of bassist Nikki Sixx, guitarist DJ Ashba and vocalist James Michael — is continuing work on material for its third album, tentatively due early next year. In a brand new interview with Revolver magazine, Sixx — who has just embarked on a twelve-show residency with MÖTLEY CRÜE at The Joint at Hard Rock Hotel & Casino in Las Vegas — spoke about how the new CD is different from its predecessors. "When we did [our 2007 debut] 'The Heroin Diaries', it was the soundtrack to a book," he said. "And when we did 'This Is Gonna Hurt', there was a lot of inspiration that drew from the photography in my book 'This Is Gonna Hurt' as well as the bandmembers' personal experiences and how they related not only to the characters in the book, but what they'd gone through growing up. Without meaning to, it hinted at this whole concept of bullying. If you're different than other people you're made fun of and you're made to believe you'll never achieve your dreams. Loosely, that's what 'This is Gonna Hurt' was about. We feel like between 'The Heroin Diaries' and 'This is Gonna Hurt', we've exposed a lot of wounds and we've talked about how to recover from them, but we haven't had a chance to really celebrate. I think this album is a celebration." Asked if SIXX: A.M. took a different approach to writing the songs this time around, Sixx said: "We put a lot fewer restrictions on ourselves. We went into genres that you wouldn't expect us to possibly be influenced by, but unless you know the bandmembers, you don't know that there are all kinds of influences, especially from the '70s and some of the great bands that came out of that era. So when we started writing, it was almost ridiculous. The songs were so left of center that you're like, 'These could never be on a record.' We were creating something so different, and once we got the songs written, people said, 'God, it reminds me of QUEEN's 'Night At The Opera' at times. It reminds me of EDGAR WINTER GROUP 'Free Ride' and these amazing things off of 'They Only Come Out At Night'. There was still the drama and the texture that SIXX: A.M. brings, but there was this celebration happening. Then as we started layering in the guitars, bass, drums and vocals, you started to go, 'Wow, this is a SIXX: A.M. album!' But it started out as not." Sixx also spoke about whether he is concerned that the musical diversions won't appeal to fans of the first two SIXX: A.M. albums. "I think SIXX: A.M. fans are going to love this record and I think new people will come in and be really surprised by it and become fans as well," he said. "I don't think our first two records sound like the same type of record, but I do think there's a sound with the band and I think we're going to continue on that tradition." SIXX: A.M., made a rare appearance — its first in four years — on April 11, 2012 at Revolver Golden Gods Awards at Club Nokia in Los Angeles. 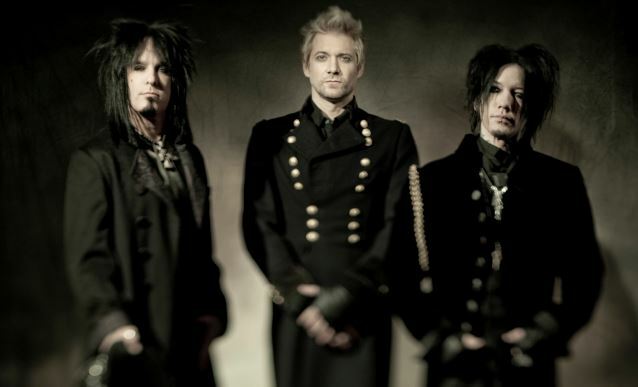 As each band member has been kept busy with their other careers — Sixx is also the bassist for MÖTLEY CRÜE and a syndicated radio host; Ashba is currently touring with GUNS N' ROSES; James Michael is a famed rock producer who is currently working on new records for PAPA ROACH, HALESTORM and others — this marked the band's first chance to perform in support of their current album, "This Is Gonna Hurt", which supplied the #1 rock anthem "Lies Of The Beautiful People". "7", the latest EP from SIXX: A.M., came out in December 2011 and sold around 2,700 copies in the United States in its first week of release. The effort contained acoustic versions of songs from the group's first two albums — 2007's "The Heroin Diaries" soundtrack and 2011's "This Is Gonna Hurt". Released on May 3, 2011, SIXX: A.M.'s sophomore album, "This Is Gonna Hurt" is a companion piece to Sixx's "This Is Gonna Hurt: Music, Photography And Life Through The Distorted Lens Of Nikki Sixx" book, a follow-up to his New York Times bestseller, "The Heroin Diaries".